Subhuti’s method was an example of “avoiding the poor and favoring the rich.” In complete contrast to him, Mahakashyapa sought alms exclusively from the poor. He thought, “Poor people should plant blessings and do good deeds, so that in their future lives they can be wealthy and honored. If I don’t help them out by receiving alms from them, then in the next life and on into the future, they will continue to be poor.” And so they were both small arhats. I believe there was another reason underlying their behavior. It seems fairly certain that Subhuti liked to eat good food, and Great Kashyapa, foremost among the disciples in his practice of asceticism, ate what others couldn’t eat, endured what others couldn’t endure, bore what others couldn’t bear, and yielded where others couldn’t yield. Evidently he was unconcerned about what kind of food he ate, so he sought alms from the poor and gave them the opportunity to plant blessings. The gifts of food and drink offered by poor people are never as fine as those given by the wealthy. The food the rich throw out on the streets is bound to be better than the offerings of the poor. Shakyamuni Buddha knew that these two disciples did not practice equality and compassion in their alms-rounds. He was aware of the discriminations they made, and so the Tathagata, the World Honored One, had admonished Subhuti and Great Kashyapa for being arhats whose hearts were not fair and equal. Ananda regarded with respect the Tathagata’s instructions on impartiality, to save everyone from doubt and slander. He was extremely respectful of this dharma-door of equality, which advised against choosing among donors. Minds that make such discriminations do not belong to the great vehicle dharma but to selfish people. Remembering the reprimand Subhuti and Great Kashyapa had received from Shakyamuni Buddha, Ananda did not want to imitate them, and so he carefully practiced equality and compassion. Shakyamuni Buddha’s dharma-door was a wide-open expedient free of the slightest obstruction, devoid of any limitation. If one begs exclusively from the rich or from the poor, one can easily arouse people’s doubts and cause them to slander the dharma. Collecting alms impartially makes everyone’s doubts and slander melt away and disappear altogether. Everyone can happily plant blessings and have his wishes fulfilled. E2 The incident of the actual fall. Shravasti was surrounded by a moat just like those found around some ancient cities in China. Water was kept in the moat at all times to form a protection for the city. Once Ananda had crossed the moat, he arrived within the confines of the great city of Shravasti. Having crossed the city moat, he walked slowly through the outer gates, his manner stern and proper as he strictly respected the rules for obtaining vegetarian food. Ananda was dignified, with eyes straight ahead, and at the same time extremely respectful. In this way he slowly passed through the outer gates of the city. He exhibited an awesome manner and model deportment; he didn’t look at improper spectacles, nor did he eavesdrop. All the time that he held his bowl, he displayed the utmost propriety and respect for the dharma of receiving, not daring to be the least bit casual or lax as he traveled through the streets. Ananda was snared by a mantra of the Kapila religion, formerly of the Brahma Heaven. Matangi had learned her false mantra from members of the tawny-haired religion. In fact, the mantric device was falsely named, because it was not really a transmission from the Brahma Heaven. Its proponents just claimed it was, and in that way got people to believe in them. However, the recitation of the mantra was able to turn Ananda’s spirit and soul upside down and he fell into a stupor as if asleep, dreaming, or drunk. Without realizing what was happening he went into the house of prostitution. The mantra “which came from the Brahma Heaven,” had rendered him totally oblivious and had totally confused his self-nature. ”Basically Ananda was a sage who had been certified as having attained the first fruition. Then why was the mantra purported to have come from the Brahma Heaven able to confuse him?” you wonder. He became confused because he had concentrated on studying the sutras and had not been attentive to samadhi-power; and so although he had attained the first fruition; his samadhi-power was still insufficient. Therefore when he encountered this kind of demon he was confused by her, and the daughter of Matangi drew him onto an impure mat. Ananda was extremely handsome. His features were almost as perfect as the thirty-two fine marks of the Buddha. Ananda’s skin was snowy white and glistened like silver, sparkled like frost. Most Indians had dark complexions but Ananda’s skin was extremely soft, supple, smooth, and especially fair. That is why Matangi’s daughter was infatuated with Ananda the moment she laid eyes on him and went running to tell her mother that she wanted Ananda. ”That doesn’t make any difference to me,” replied her daughter. “Mother, you’re going to have to think of a way to trap Ananda for me. If I can’t marry Ananda I won’t go on living,” she said obstinately. Her desire was so overpowering that it was a matter of life and death. ”Ah,” thought Matangi, “She loves him so much. I’ll have to think of a way to do what cannot be done.” So she used the mantra, a deviant dharma from the Kapila religion, and recited until Ananda became hypnotized. He followed her in a daze like a drunken beggar, in such a stupor that he couldn’t tell east from west, or north from south. He went right into the house and followed Matangi’s daughter into her room and onto the bed. This was a dangerous spot to be in! With her licentious body she caressed him until he was on the verge of destroying the precept-substance. He still hadn’t broken it. This is an important point. When one receives the precepts one becomes endowed with a certain substance, which, if destroyed, is as serious as if your very life had been cut off. It is extremely important for people who have left the home-life not to break precepts. If precepts are broken, you might just as well die. As for Ananda, if the text said that his precept-substance was “already” destroyed, it would mean it would be all over for him, Ananda would have fallen, and in the future he would have had a great deal of difficulty in cultivating successfully. Why did Matangi’s daughter have such a compelling attraction for Ananda? It stemmed from the fact that Ananda and Matangi’s daughter had been married to one another in five hundred former lives. Because they had been a married couple in so many former lives, as soon as she saw Ananda this time, her old habits took over, and she fell madly in love with him. Ananda had been her husband before and she was determined to have him for a husband again. Because of those seeds passed down life after life, she was now willing to sacrifice everything - even her very life - for the sake of her love for Ananda. D4 The Tathagata compassionately rescues him. E1 He quickly returns and speaks the mantra. The king, great officials, elders, and laypeople followed along after the Buddha, desiring to hear the essentials of the dharma. Everyone knew that there was some important reason why the Buddha had not spoken dharma for the vegetarian host after the meal. They thought that the reason for the hasty retreat would certainly be announced, so everyone - the king, the officials, the elders, and the laypeople - followed the Buddha back to the sublime abode of the Jeta Grove. Why? Everyone had forgotten everything else but the single-minded desire to understand whatever important principle of dharma was about to be spoken. They didn’t know what had come up that was so unusual. Everyone was anxious to hear what the Buddha would say. 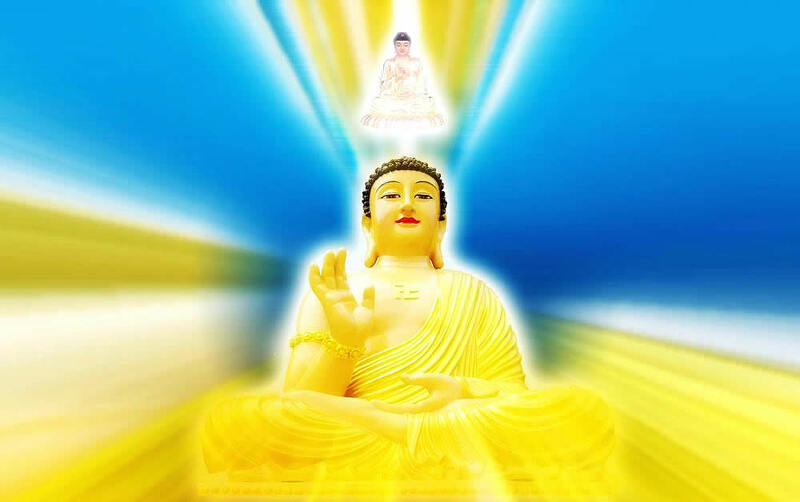 The hundred rays of jeweled light also brought forth a thousand-petalled jeweled lotus, upon which was seated a transformation-body Buddha in full-lotus posture. In “full lotus posture” you sit with your legs crossed over one another, your feet resting on the tops of opposite thighs. There is a great deal of merit and virtue involved in sitting in full lotus. This transformation-body Buddha was proclaiming a spiritual mantra. He pronounced the Shurangama Mantra. 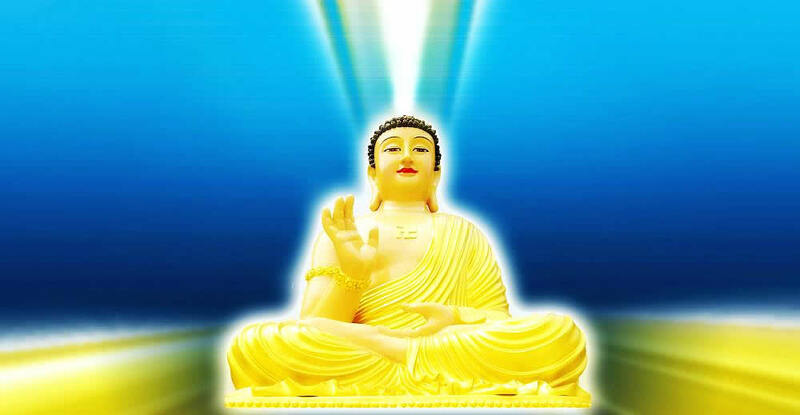 For Shakyamuni Buddha to have a transformation-body Buddha speak the mantra represents the secret cause within the secret cause, the king of kings of mantras. The Shurangama Mantra is extremely important. If you who study the Buddhadharma can learn the Shurangama Mantra in this life, you will not have been a human being in vain. If you do not learn the Shurangama Mantra, it will be like climbing a mountain made of the seven jewels - gold, silver, crystal, lapis lazuli, mother-of-pearl, red pearl, and carnelian - and coming back down empty-handed. You arrive at the top of the mountain and you think about picking up some gold or perhaps some pearls, but then wonder if you should take silver instead. In the end you can’t decide which ones it would be best to take and so you come away without any at all. That is the situation of people who can’t memorize the Shurangama Mantra. So I hope that everyone will at the very least study hard enough so that they are able to recite it from memory. Not to speak of several weeks’ effort, it is worth several years’ effort if needed. It is extremely valuable. And this opportunity you have now to encounter it is extremely rare, very hard to come by. It is “the unsurpassed, profound, subtle, wonderful dharma.” There is nothing higher, nothing deeper. The Buddha used the Shurangama Mantra to save Ananda, who had already attained the first fruition of arhatship. Now, if you ordinary people do not rely on the Shurangama Mantra, how can you end birth and death? Therefore each of you should resolve to take my advice in this. I will tell you a story that illustrates the merit of sitting in full lotus-posture. Once there was a bhikshu who did not cultivate, but concentrated instead on reciting sutras and repentances for the dead for money. Whenever someone died, he would accept requests to take the deceased across the sea of suffering by reciting sutras and performing repentances. He passed on by, but the words echoed in his ears. Why had that man called him a “ghost who peddles sutras and repentances”? Why hadn’t he called him a “Buddha” who peddles sutras and repentances? Or an “Immortal Sage” who peddles sutras and repentances? As he continued on his way to the monastery, it suddenly began to rain and he took shelter under a bridge. “I guess I’ll sit in meditation,” he thought, and he pulled up his legs in full-lotus posture. After he had sat for a while, two ghosts came by. When they reached the spot where he was sitting they suddenly stopped, and one said to the other, “There’s a golden pagoda! Hurry up! Let’s start bowing. ”So what?” said the other. “Silver pagodas are still something special. We should keep bowing.” So the two of them kept bowing. They bowed for about half an hour or an hour, or maybe it was only twenty minutes; there was no clock, so there’s no way to know. Soon enough the bhikshu’s legs hurt again. He unfolded them and lazily stretched them out, just like some people do when they are tired of sitting in meditation. “I think I’ll lie down,” he thought. But just then the two bowing ghosts caught a glimpse of their pagoda turning into a pile of mud. “Hey! Look at that!” one cried. “Quick! Let’s clobber it.” Realizing the ghosts were about to beat him up, the bhikshu froze in fear and slipped neatly back into full lotus just in the nick of time. “Oh!” the two ghosts cried in unison. “It does have the Buddha’s relics in it! It’s going through all kinds of weird changes. One minute it’s a golden pagoda, the next a silver pagoda, and then it turns into mud. We’d better just keep bowing no matter what happens next,” and they continued non-stop until dawn. The incident had a lasting effect on the “ghost who peddled sutras and repentances.” He sat there thinking, “If I sit in full lotus there is a golden pagoda, if I sit in half lotus there is a silver pagoda, and if I don’t sit at all there’s nothing but a pile of mud. I had better start to cultivate and stop peddling sutras and repentances.” He buried himself in the task at hand and worked diligently at his cultivation. After he had cultivated, he eventually became enlightened and was given the name Dhyana Master Gui Bi, “Pressured by Ghosts,” because if it hadn’t been for those two ghosts who were threatening to beat him up, he might have continued to procrastinate and never gotten around to cultivating.